Rogue gains Skulks trashed by War to get more Gold. With Cursed Village as the only village, Hexes were flying like mad and I had turns where I played a Skulk, 6 Werewolves and a Vampire for Hexes. My opponent resigned out of frustration with the length of the game, though they were sure they would have won. I finished against the Rat because I was having fun. 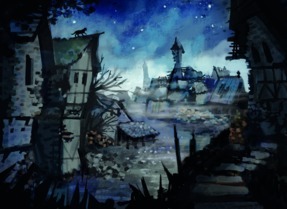 Open Skulk and then go for Count/Cursed Village? At least Hireling / Cursed Village should rule each other out, where my preference would be for the Village. Skulk is the only source of +Buy so you can't feed them all to Apprentice if you want to have multiple Buys. I would trash the first Skulk early to Apprentice though, use Apprentice to trash Copper when there is a Cursed Village in sight, get one Rogue to re-gain Skulk/Gold from trash (and ready the hand for the next CV), skip Potion for Skulk in the opening but would buy Potion with the next $4 hand, mostly ignore the generic hand-filler like Werewolf and Laboratory, relying on the Pool and Village to fill my hand, trying to manage the ebb and flow of drawing, playing and trashing. I don't have Alchemy, so don't have great intuition about Apprentice, but what would happen if one focused on Skulk+Apprentice to gradually turn your deck Gold with a bit of +Buy, draw and hexing? It feels like that might be very quick. Skulk + Apprentice is reasonably quick, but a bit worse than say Market Square + Apprentice. Probably this interaction is worth making use of (especially with rogues gaining back the skulks), but I'd think that you'd still want to include a lot of other stuff.